The procedure for the suspension control arm (wishbone) removal is the same for both the Left and Right hand side arms. 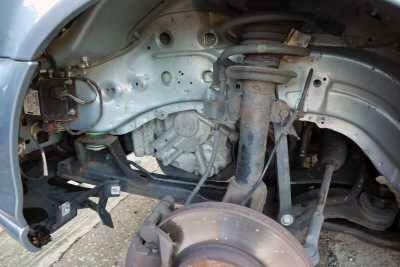 Whilst it is possible to drop the entire front sub chassis, to replace both lower suspension arms during the same operation, this is not recommended unless you have suitable alignment tools (see XT204-9.pdf ) The following procedure is only for changing one side at a time. Access to a Ramp (Lift) or Pit is recommended for this process, however if a ramp or pit is unavailable this procedure can be done on flat ground. 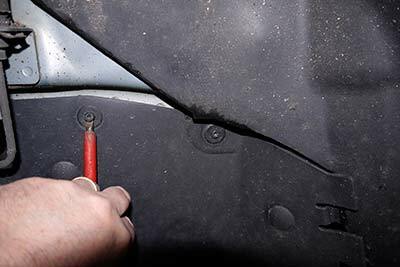 Ensuring that the jack point is clear of the front sub frame and the securing plate at the rear fixing point raise the vehicle on the side that you are changing and remove the wheel, . Release the 17mm nut that clamps the ball joint.